You don't teach history chronologically? Surely you're not playing with a full deck, Lady. History is NOTHING if not chronological! I think history is chronological. But, I don't feel compelled to teach it EXACTLY in order. At least not to very young kids. If I was going to teach it to students in upper elementary and above, then sure. I would make it chronological. I would begin at the beginning...I'd start with the Ancients. But, when I was just putting my baby toe into the shallow end of homeschooling, I only had Littles...four kids under five, to be precise. I wanted to add in some lovely living-literature style books that would not only cultivate a love for a good story, but also provide a simple start to history. Because the truth is, in those first formative elementary years, history shouldn't be about names and dates. It should be about the big picture. It should be about painting a broad perspective. A peek into history should make our problems seem very small. It should dispel narcism. It should make us realize that there is something bigger than ourselves. It should take the KNOWN and slowly sprinkle in the UNKNOWN. And so, instead of starting with the Ancients, I began with US History. To be honest, I got a few raised eyebrows and blank stares from around my homeschooling community. But, I plowed ahead with firm resolve knowing that there was quite a lot of method to my "madness." "Chronological" is not developmentally appropriate. A basic study of child growth and development will reveal that the average child does not possess the ability to view history as a linear story that has a chronological order until he is in about third grade. It's just a concept that is developmentally impossible for him to grasp. Most of history is viewed through the general lens of "the past." It is segmented and disjointed. He can learn that the Civil War was an event in the past and that the Trojan War was also an event in the past. But, he does not possess the cognitive ability to place those two events in the correct order and in the proper relationship with all other history. Of course, as with all developmental milestones, there are exceptions to the rule. But, on the whole, until a child is around 8 or 9 years-old, he is incapable of fully understanding linear time. I prefer to start with the KNOWN. The best way to teach ANYTHING is to start with what a child already knows and add onto it bit by bit. Since an American child already has a built in frame-work of knowledge for all-things-American, US History is so much easier for them to grasp than Ancient history. Although much has changed since the fight between the Georges (Washington and the King of England), much is the same. The religious, social, and political structure is still very similar. Family-life and worship practices are somewhat comparable. Even things as basic as baby names, public fashion, and home decor remain largely alike. One quick study of Ancient Greece and Egypt, however, reveal a whole bag of contrast. The culture, at large, was vastly different from ours and requires a young child to start a history study with little to no frame of reference. But, an American history study is just an extension of the culture he already knows. In addition, even if a child doesn't know the specifics surrounding certain people, places, and events in American history, he can most likely recognize key phrases and names. In other words, he might not know HOW and WHY George Washington crossed the Delaware, but he has probably heard of the the name George Washington. His picture is on our money, on our statues, on our federal buildings. His name graces the fronts of libraries, schools, and vacation destinations. Such general knowledge of key terms makes it so much easier for a young child to learn American history. The ancient sub-text is not always age appropriate. Let's face it, the history of Ancient peoples (even the Israelites) is steeped in idol worship, cultish behavior, and sexual perversion. You can not separate one from the other. So much of the story came about because of these three things. While I am all for painting an accurate picture of history (both the good and the bad parts), I don't think it is always appropriate for really young kids whose innocence has not been tainted by harsh realities. Admittedly, American history has its own share of stains. But, on the flip side, it also begins with the premise of "In God We Trust" and is saturated with Christian themes. Quality ancient-themed literature is scarce. Clearly, I'm not the only one with definitive views about chronological history. Writers and publishers seem to agree. While there is a plethora of wonderful American living literature for even the youngest of learners (including my all-time favorite and second-favorite children's books), there is quite a shortage of quality ancient history books for young kids. And, if we are being really honest, we'd all have to admit that the majority of ancient books that ARE on the market for the lower elementary crowd really only emphasize the culture of the day, not the actual chronological history. While there is merit in learning about the lifestyles and societal customs of the Greeks and Romans, a history study should include more than just what a people group ate, how they dressed, and how they interacted with others. All of that could be lumped into a cultural or social studies unit, but it shouldn't be called "history." If I had taught history chronologically and had started with the "beginning," not only would I have struggled to find age-appropriate living literature for my young kids, I would have also suffered the disappointment that would have come several years later when we finally got around to studying the New World. At that point, most of my kids would have been too old to fully enjoy and appreciate all the wonderfully written and illustrated American picture books that reveal BIG TRUTHS for little eyes. Because although some fifth and sixth graders might not mind looking through The Hatmaker's Sign or The Glorious Flight, there are more age-appropriate books for them that they'd probably prefer at that point. All those picture books would be cast aside and never fully appreciated. Making "log cabins" with popsicle sticks. Obviously, with a wide range of learners now, some of my history dogma has had to relax. My kindergarten son had to jump into our group history learning last year when we were studying Ancient Rome. It's not ideal. But since he and his younger brother will still be in their early elementary years by the time we cycle back to US History, I know that they will eventually be able to benefit from my unconventional history plan. I don't teach history chronologically. My way is out-of-order and a bit unusual. 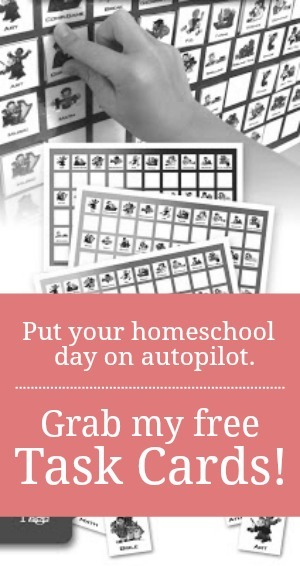 But, in the grand chronology of their homeschooling experience, my unorthodox method has, so far, given my children a wonderful history of history. Glad to hear that I am not the only one! Though we live in Europe and ancients wouldn't have been a complete unknown it's certainly not age appropriate. I am starting from the modern years and going backwards for the first cycle landing at ancients at later elementary when myths, idolatry, blood crimes and sexual references can be more easily understood. Furthermore starting by what we commemorate in our national day and other holidays gives children a better understanding of the world they live in and also they are able to respond to those annoying questions from relatives and we'll meaning people the style do you know what happened today x years ago? Or who was whatever important person or who is the king /president of our country. Thank you for confirming that I don't need to follow the crowds all the time to see results. Yes, national holidays and landmarks are other great reasons to start with US history. Well said. I was just having this conversation with my husband (who responded with a supportive but vague 'whatever you think is best'). Thanks for the reassurance that I wasn't making a huge mistake by going against the grain. I am planning to cover US history in first and second grade, then start with ancients in third, so I'm glad to read my plan is developmentally appropriate as well as practical. It seems like I often find my thoughts clarified and supported on your site - in fact I often search it when I'm trying to make a decision on school, allowance, schedules, etc. Your post the other day about not comparing ourselves to what we see online made me laugh, because when I read your blog I always think "she really has it all figured out. I should be more like that"! Nope. I don't have it all figured out. Not by a long shot. I learn as I go. It's a lot of trial and error as with all of life. Thanks for reading. I'm glad you're here. WOw - You are smart to think this through! There is so much US quality lit. for littles. Beautiful Feet is a curriculum/group that presented these very arguments as I was researching yesterday - gave me some really good food for thought. Thank you and good for you for sticking to your conviction. Our family has chosen to study US history first for the exact same reasons! The quality and quantity of available books for American history is amazing! That has really allowed my kids to get deeper into important events and build richer connections. Thanks for this affirming post! I'd rather go deep in a few areas than cast a net a mile wide but only a few inches deep. The plethora of available US History books certainly helps us in our efforts. I’m so glad I stumbled upon this post. 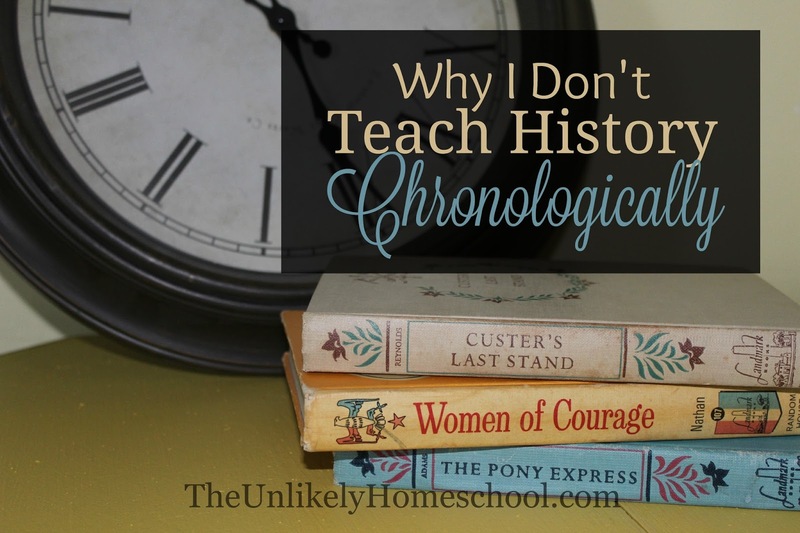 This is our very first year homeschooling and I’ve nearly wanted to rip my hair out trying to find something that works for History and what exactly to teach my 8 year old. We started with just watching documentaries on Netflix/Prime Video and getting ancient civilization books of what she thought was interesting from the library but that kept me worried I was doing something wrong and that’s not what 3rd graders should be learning about yet. Then we borrowed the Usborne Internet-linked Encyclopedia of World History from our library and that was fun but then we had to give the book back after a few weeks and now here I am stuck again and wondering where to begin again. I think a study of the history our home state would be fun and to build up from to the history of the US and American History. I keep freaking myself out because I keep going back to a public school mindset of how history was taught to me and it’s making me a wreck. I'm so glad this post was helpful for you! Just remember, there is no "right" age to learn about certain periods of history. You know your kids, do what works best for you and yours.